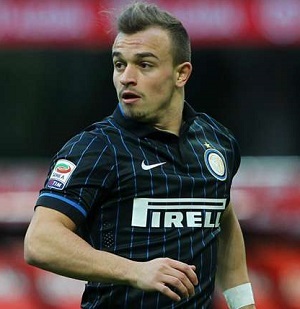 Shaqiri had one goal and two assists in 15 appearances for Inter Milan this season. During a recent visit to his ancestral home country of Kosovo, international soccer star Xherdan Shaqiri landed in the center of controversy when a photo of him posing with an allegedly extremist imam surfaced online. Shaqiri was born in Yugoslavia to Albanian Kosovar parents, raised in Switzerland, and after winning three league championships and a UEFA Champions League title in Germany with Bayern Munich, he signed with Italy’s Inter Milan club this season. The 23-year-old forward/midfielder is the star of Switzerland’s national team and is one of the premier faces of Nike’s soccer marketing efforts. While in Kosovo’s capital city of Pristina during this offseason, Shaqiri was photographed smiling and shaking hands with Shefqet Krasniqi, an imam who was arrested in September 2014 on suspicion of terrorism and inciting racial hatred. The arrest stemmed from an alleged plot in which Krasniqi was attempting to recruit Muslims to fight in Syria. He was eventually released from custody. A picture of the imam Shefqet Krasniqi and myself has caused a lot of unnecessary fuss. He approached me and asked for a photo, the same as thousands of other people have done. I posed for one as it would have been rude to refuse his request. I did not know that the imam was linked to terrorism. I can’t check the character of every fan who wants to take a photo of me. We Shaqiris are observant Muslims, but we are a long way from everything extreme. It seems Shaqiri’s perfectly reasonable explanation is turning this story into a non-story. Which is a bit surprising considering that in today’s culture of routine public overreaction to constant media sensationalism, a lot of people lose touch with reason when fueled by Islamophobia. Shaqiri with imam Shefqet Krasniqi.